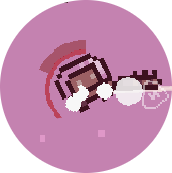 Holey Suit, a quirky space survival game! Although I released my game in pre-alpha two weeks ago and am regularly pushing updates & devblogs, I realise there is little or no context available to the itch community on the actual game! I thought I'd write a post on the forum to give some background on how the game came about. So, where did the game concept came from? Had I thought of a space survival game with quirky controls from the onset? Heck no!!! The game actually came about because of Mark Brown's GMTK Jam. It was hosted on itch, so you folks interested by game dev probably heard about it already! Mark Brown produces the Game Maker Toolkit youtube channel and has been a great source of inspiration for me. As it turns out, Holey Suit wasn't released as part of the jam at all. It was actually started two weeks before the jam, because GMTK Jam fell on a weekend I wasn't available! I still really wanted to have a go at it though, so why the heck not, I decided to pick a theme ahead of the jam and go commando. As it turns out - the theme I had picked (dual purpose mechanics) was indeed the official jam theme. By jam weekend I was still under the allocated time (48hrs) but decided it wasn't fair (and against the rules!) to post Holey Suit as an entry. I actually had wanted to experiment with the "shoot to move" mechanic for a long time, so it didn't bother me too much to miss out on the jam. Besides - the jam was hugely successful and received hundreds of entries - very unlikely the prototype I had back then would have made it to the top. The development process actually felt a lot more natural spread across weeks, not hours, and a few of the fundamental mechanics I established as ideas matured in my head. I posted a full fledged post here on my website if you want to read more about it. Within a few days, I basically had nailed down the premise: survival in zero gravity. The rest was just designing mechanics that suited the theme, and as elegant as possible. So the game is out and has been doing fine so far, with 700 downloads in just over two weeks, and a few let's play on youtube. I was lucky enough that @leafo featured the game on the front page! I'm hoping downloads carry on as I keep adding new content to the game. The game will remain in pre-alpha for a while - I think it reached a status where the arcade mode is more than playable. My objective is to add a story mode next, with missions to complete. This will take time, but I think will be rewarding & hopefully will be well received by players! As per the game page, this is a hobby project. I am not planning to make monies from the game, this will remain free. What I ask in return is that anyone that enjoy the game rates it, post a comment or feedback! Hope you enjoyed the read, and stay tuned for more Holey Suit updates & content! Hello everyone, fresh addition to the Holey Suit dev blog! I guess some of us on Itch.io had the eternal debate: should I also publish my game on Gamejolt? Maybe most of us here publish on both sites, why the heck not? I'm afraid results aren't as good on Gamejolt!! Why? Well, for a start - Holey Suit got a feature spot on its initial release on Itch.io, which definitely helped! Second, I struggled for a bit with the Gamejolt categories/hashtags system - the game was getting a poor conversion rate (i.e. only a few people were looking at the game page and then downloading it). A month down the line though - you can notice both graphs ease in to slower download rates. In October, I am getting roughly 5 to 6 downloads a day on average for both sites, although in general the game is still doing slightly better on Itch.io. This tells me at least the game page is properly configured and people are finding & downloading the game. Not an amazing download rate but steady, so I am very happy with that! And of course, don't forget to check out the game!!!!! I also took the opportunity during this big update to change one of the core mechanic of the game: weapons. 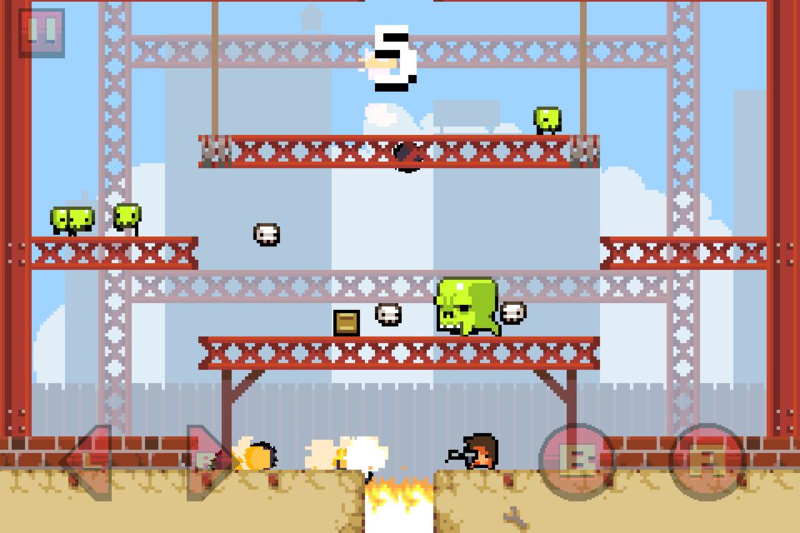 Prior to the update, weapons would recharge automatically. This fits pretty well in a sci-fi game, the idea being your character's suit had a reactor to power weapons etc. People couldn't be too trigger happy as it would mean they would run out and have to wait for energy to regenerate. So it forced a nice balance of shooting frantically and pace yourself to allow the energy to regen. Another mechanic in the game was crates: I'm not shy of my Vlambeer's influences, and Holey Suit's weapon system was heavily influenced by Super Crate Box in which you need to collect crates to equip weapons. Sometime the weapon is great, sometime not. Roll of dice, but one thing was sure: it keeps players on their toes! Holey Suit was sitting on the fence with its crate system. Picking up a crate would give you a weapon, but since your energy would automatically regenerate, players were not pressured to pick up another one if they liked their weapon. Worst: players would get frustrated picking up the wrong weapon. I tried my best to keep the weapons balanced, but since all weapons promote different play styles, everyone would have their favourite. Bottom line: I was trying to mix two designs which do not seem to marry well. On one hand, I was giving players the ability to stick to their favourite weapon (through regenerating ammo), whilst getting them frustrated when they picked the wrong one. Conclusion? From now on, energy no longer regenerates! Players might love it or hate it, but it will certainly promote the Super Crate Box play style I originally intended for the game. Now: crossed fingers this doesn't put people off. Balancing game mechanics is an art, changing things halfway is a bit of a gamble and I hope this change is received well! Pushing Holey Suit to the finish line! I thought I'd put a final post on this dev blog: Holey Suit 1.0 is now out! This is the first project I complete, ever! So big pat on the shoulder to myself for polishing and closing off the game. Since its original pre-alpha release it accumulated over 2000 downloads across Gamejolt & Itch.io. Overall, a great experience. Really happy to have published on both itch.io & Gamejolt - both platforms are different but the communities on either are great and the people behind them have done an amazing job and make life for little dev guys like me very easy. 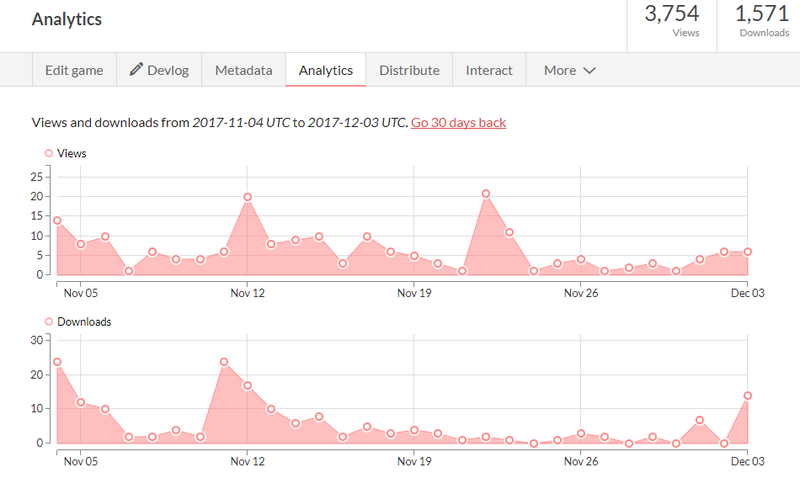 Some explanations: I believe the spikes in downloads are down to people having installed the game with the itch.io app, as these correlate with me pushing an updated version of the game, which I imagine triggers an auto download. It would also explains why spikes in views (the November spike for example, down to a post of Reddit) doesn't necessarily translate in downloads. Either way, despite being the game no longer being on the front page (you can see in previous blog post that this translated in a serious downloads spree) it still gets a few downloads a day. It also got a review (and 70/100 score!) on a Czech game magazine website! So what next for the future? I'll probably still do bits and bobs on Holey Suit, but for now I'd like to move to the next project! I have several ideas I'd like to toy with, so stay tuned!